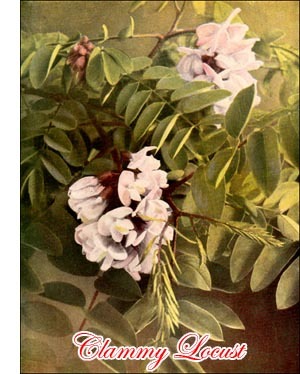 The Clammy Locust (Robinia viscosa, Vent.) is a little, rough-barked tree that grows wild in the mountains of North Carolina. It is a favourite garden ornament, for it has delicate feathery foliage and the shaded pinks of its close flower cluster make a combination of form and colour no artist can resist. The calyxes are dark red, and all the new growth shines with the sticky substance that exudes from the covering of glandular hairs, and gives the tree its name. The spines are inconspicuous.